From the Olivier Award-nominated producers of West End smash-hit The Gruffalo comes a brand new musical adventure for the whole family. 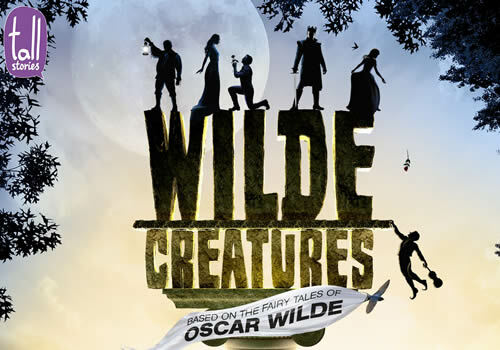 Tall Stories adapts a selection of Oscar Wilde’s classic fairy tales in Wilde Creatures, which plays at the Vaudeville Theatre this Christmas as part of Dominic Dromgoole’s year-long celebration of the acclaimed playwright. Taking audiences on a journey through magical palaces and enchanting forests, Wilde Creatures sees a band of musicians tell stories such as The Happy Prince, The Nightingale and the Rose and The Birthday of the Infanta. Set on a cold, dark night, the North Wind is blowing and there’s an empty platform where a statue once stood. Who of the townsfolk is important enough to be immortalised in stone? Could it be the self-important Mayor, the pompous Princess or a completely love-sick student? It’s the storytellers’ job to find out, as they deliver Wilde’s beautiful tales with charming live music and a large dose of comedy. Wilde Creatures marks Tall Stories’ 20th anniversary year, with one of their original 1997 productions being an adaptation of Oscar Wilde’s The Happy Prince. Since then, the theatre company has gone on to create and develop a number of children’s shows, including The Gruffalo series and Room on the Broom, which have enjoyed global and West End success. Playing a strictly limited season at the Vaudeville Theatre from December 15th to December 31st 2017, before embarking on a 2018 UK tour, Wilde Creatures features as part of a celebratory season of the established playwright, with other productions including A Woman of No Importance, Lady Windermere’s Fan, An Ideal Husband and The Importance of Being Earnest. Wilde Creatures is suitable for anyone aged between 5 and 105.